Marshmallows are a curious sweet treat for me. When I was younger I wasn't crazy about them, I loved to heat them up in the microwave and watch them expand, but I never ate them straight out of the packet that much. But ever since Sweetness The Patisserie opened up near me I found out how good handmade marshmallows could be. It was a revelation, and I have been making my own marshmallows ever since. I only ever use store-bought ones when I need to use marshmallows as part of another recipe and I'm too lazy to whip up my own. Now that I have a KitchenAid, marshmallows are a so quick and easy to make and the mixer does all the work to make them super fluffy. All I have to do is stand back and watch the magic happen. It's been a while since I made a batch of marshmallows, I've been waiting to come up with a fun new flavour and I finally came up with Oreo Marshmallows. 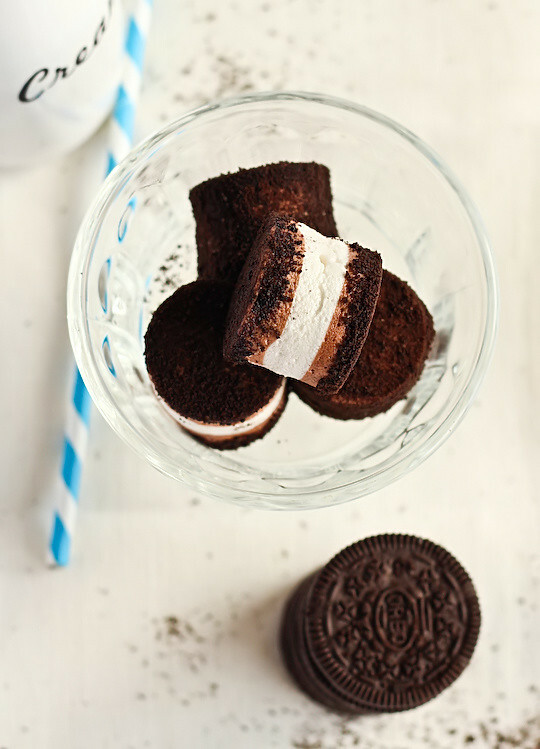 These Cookies & Cream flavoured marshmallows are made up of three layers; two chocolate layers with a vanilla layer in the middle and they're rolled in Oreo cookie crumbs, rather than dusting them with snow sugar. I was undecided about the best way to present these marshmallows. Originally I was just going to cover marshmallows all over with cookie crumb, but the three different layers of marshmallows were so pretty it seemed like a shame it cover it up! So I did half the marshmallows completely covered in crumbs and only crumbed the top and bottom of the other half so you can still see the layers. Obviously covering the whole surface of the marshmallow is more practical if you're going to put them in to bags and then people get a nice surprise when they bite into the marshmallow and see the layers, but if you're serving them on a plate then just covering the ends will work. It's entirely up to you which way you cover them. I was really happy with how the recipe turned out. I used my usual marshmallow recipe which I love since it uses glucose syrup instead of corn syrup and uses powdered gelatine instead of leaves. I just added some rich dark cocoa powder to the two chocolate layers expecting the cocoa to only lightly tint the marshmallow, but was pleasantly surprise to see the colour seemed to darken overnight, giving it great contrast against the white vanilla layer in the middle. I love the lovely crunchy outside that the layer of crumbs give the marshmallows, as well as giving it a slight dark bitter chocolate flavour. It's definitely an interesting twist on a normal marshmallow. Marshmallow making is definitely a lot easier when you have a stand mixer; there's a lot of whisking involved and pouring hot sugar syrup at the same time that can be tricky. I have made it before with a handmixer, but it's hard work and I would definitely recommend you make it with the help of someone else in the kitchen. But trust me, it's worth all the effort to make your own marshmallows and you'll never want to eat store-bought marshmallows again. P.S. these particular ones go great with a glass of milk or hot chocolate. This recipe requires making three layers of separate marshmallow, one chocolate layer, then vanilla and then another chocolate layer. Note: if you want to simplify things, you can just make the whole thing just vanilla (or just chocolate) marshmallow and do the entire thing in one go (though your mixing bowl may not have the capacity for this, so you may need to use 2/3 the ingredients). Grease and line the base and sides with baking paper in a 24x32cm lamington tray, or two 20cm square cake tins. Prepare one of the chocolate layers first - place 250g caster sugar, 2 tsp glucose and 100ml water in a small saucepan. Place on low heat and stir until the sugar has dissolved. Place 100ml cold water in a small bowl and sprinkle 1 tbsp gelatine powder over it and set aside to soften. Increase heat on saucepan to medium-high and insert a sugar thermometer. Boil for 3-5 minutes, until sugar thermometer reaches 120°C (250°F). Remove from the heat and carefully add gelatine to mixture and whisk until gelatine dissolves and no lumps remain (if you are worried about this step you can heat the bowl of gelatine over a pot of simmering water first to make it smoother). Place egg white in a large mixing bowl and start beating with an electric mixer with a whisk attachment on high speed. Gradually add hot sugar syrup to the egg white while mixing, if you are using a hand mixer you should beat your egg whites to a stiff peak before you start adding the syrup, but it works fine to add it as soon as you start beating the egg in a stand mixer. Beat until mixture is glossy and white, about 5 minutes on a stand mixer and closer to 10 with a hand mixer. Sift in 1 tbsp cocoa powder and beat again until combined. Before mixture starts to cool too much, pour mixture into prepared tin and use a spatula to quickly smooth top. Try to keep it as smooth as possible so you have nice, neat layers. Repeat process for second and third layer, replacing the cocoa with vanilla extract for the second layer. Leave to set at room temperature overnight. Remove filling from Oreo cookies, I used a knife to scrape it off. Place in a food processor and pulse or smash in a ziplock bag to a fine crumb. Using a round 3-4 cm cutter to cut out marshmallows, or cut into squares. I found it was best to lightly grease the cutter with some vegetable oil before cutting each marshmallow, cutting with a twisting motion. Roll marshmallows in cookie crumbs, or just dip each end in the crumbs depending on how you prefer to present them. Place on a piece of baking paper to dry for at least a few hours, then store in an airtight container. Best eaten within two days. Omg! Love this so much. You're so clever to cover it with biscuit crumbs. I love making marshmallows with my Kitchen Aid too, too easy! 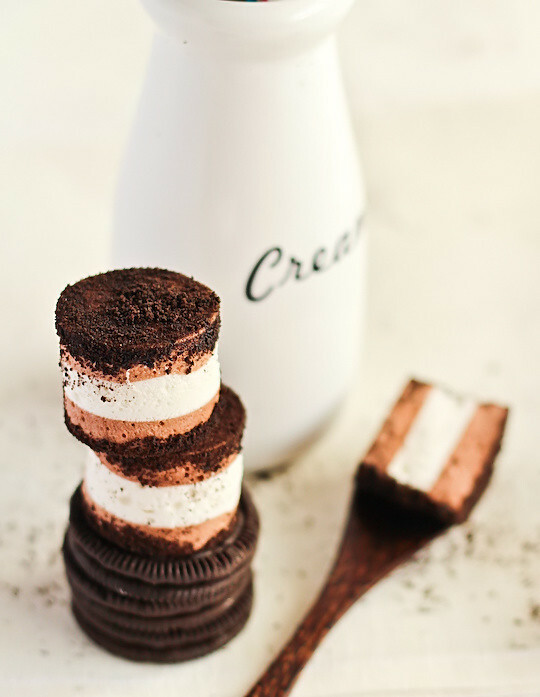 you always come up with the most creative and delectable goodies! They look so cute and yummy! What a great idea! So cute! I never bothered with marshmallows until I got my Kitchenaid, I would have had to beat them by hand! Ouch! Didn´t know I could make marshmallows with the KA. I have to try these. They look so cute!. 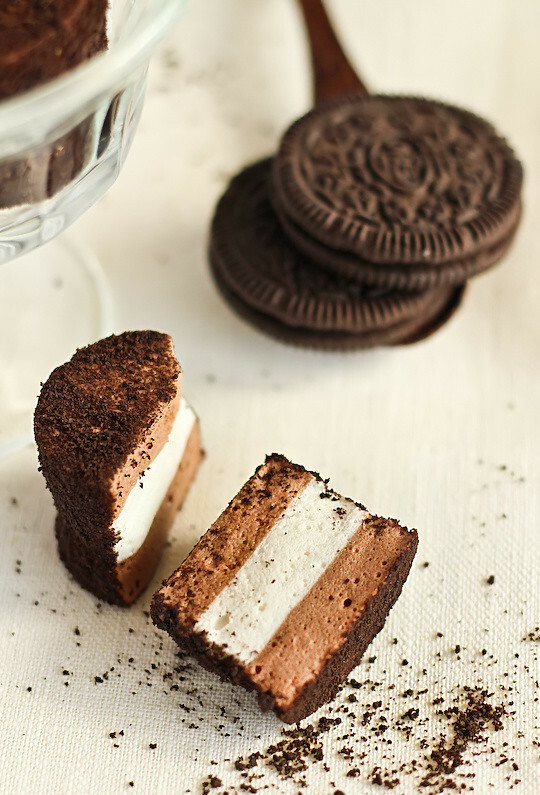 Ohmygosh these look amazing. How strong is the cocoa flavor? wow! 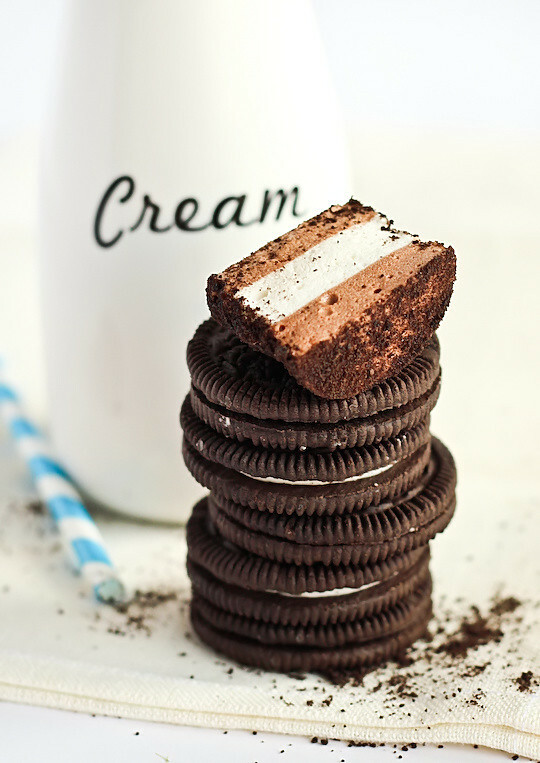 these will take smores to a new level. genius! these are beautiful!!! love the pics! wow - they look absolutely fantastic! love the pics! What a great idea.. were do you come up with these recipes?? 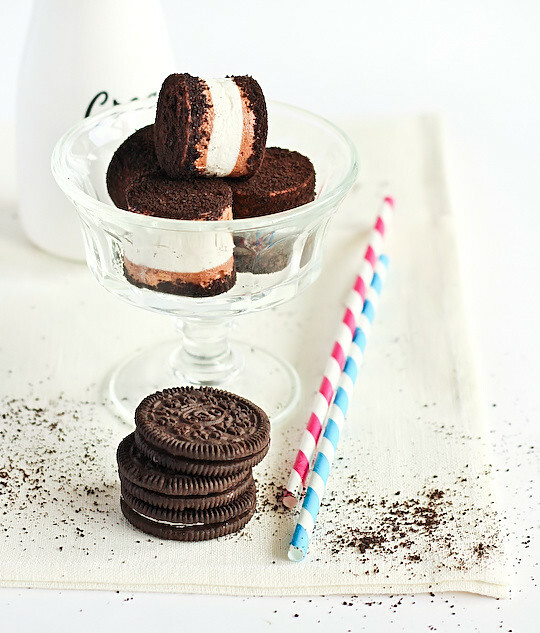 I've never made marshmallows - never completely sure about their texture either, but combined with oreo cookies these look amazing! I've got some egg white in my fridge after making a really rich ice cream yesterday so am going to give this a go! This is a brilliant idea! How creative -- nice work! Lovely presentation! 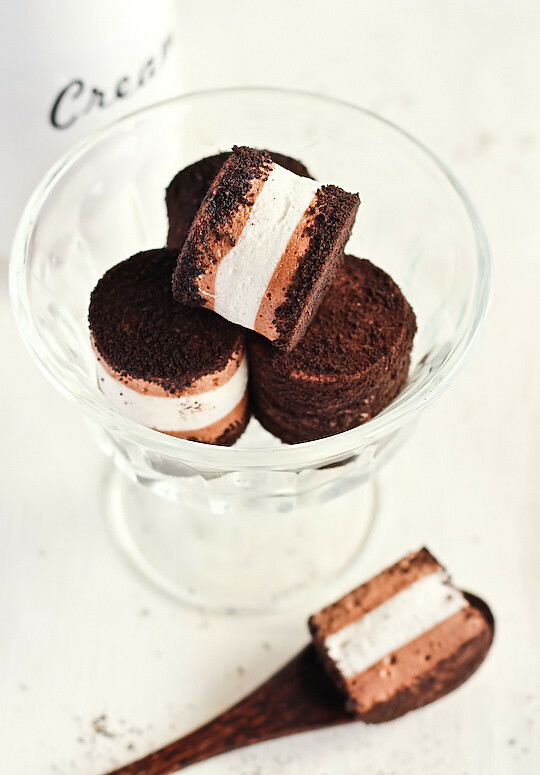 Love chocolate marshmallows! Yum! I love your recipe, idea more brilliant and exquisite, the only danger is the kilos, but he has to go, patience. Congratulations from Madrid. Oh, these are so cute! And a nice alternative for those who don't like plain marshmallows. I could quite happily devour all of these lol. They looks so delicious! you have no baking powder in there so it doesn't matter whether the cocoa powder is dutch processed. have_knowledge - Thanks for being a know-it-all but that has nothing to do with why I used dutch process. I used it because it has a smoother flavour and better colour. love this idea and your creativity! i've been dying to make my own marshmallows.. everyone raves about how great they are when they make them at home.. but i don't have a stand mixer :( and i'm scared of all the sticky mess, haha. How funny, as a kid I only liked marshmallows if it meant watching the expand (blow up) in the microwave. And as an adult, same thing, I buy them for recipes, but homemade is SOOO much better. 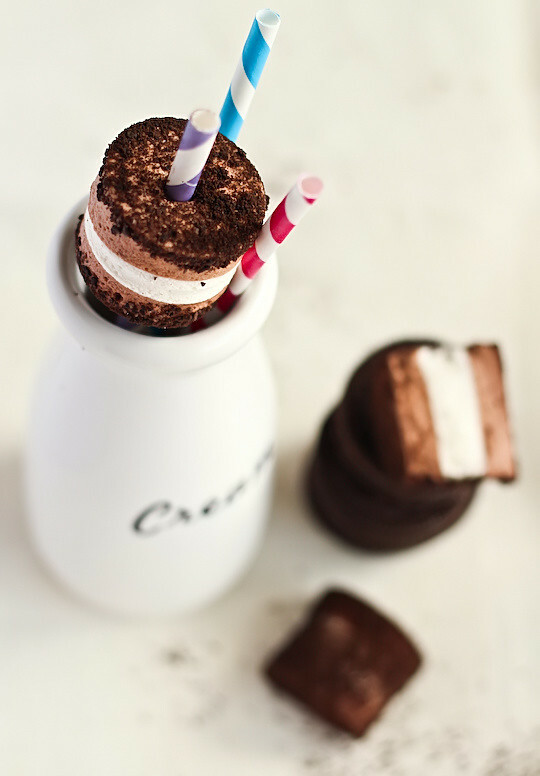 Amazing idea for cookies and cream mallows! Jacq - Thanks Jacq!! Haha they were so fun to make! Phuoc'n Delicious - Thanks Phuoc! The biscuit crumbs were the best bit! <3 KitchenAids so much! shaz@feedingmykidsbetter - Aw thank you! Kimberley - Thanks so much! Hanna - Yeah I didn't really bother making them til I got my KA, it takes all the work out of it! 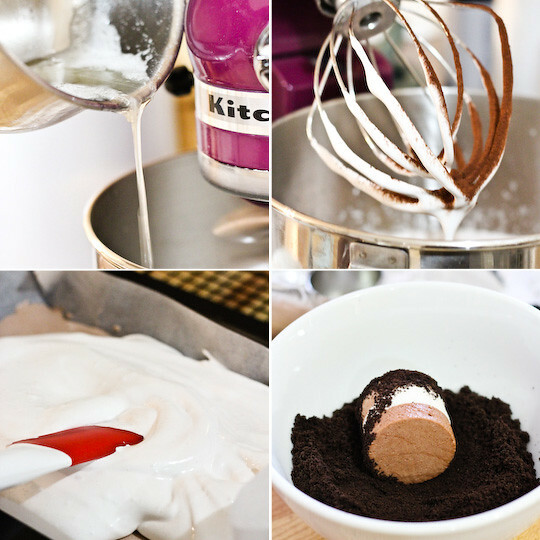 decocinasytacones - You can do it with any electric mixer, but stand mixers are the easiest for it! Hayley Daen - Haha I hadn't even thought of smores, but you're so right! Stephanie - Thanks so much! I bought the glass especially for them! Jennifurla - Yay! Glad it's not just me. Marshmallows in hot drinks are the best. La Roquette - Haha in my crazy brain! thelittleloaf - Try making some! Homemade ones are the bomb. Sarah from 20somethingcupcakes - Thanks so much! Susan - Thanks so much! Dharma - Haha thanks! They're not too bad for you ;) In moderation. Julia @ Boredom Abounds - I like my marshmallows fun and fluffy! Vivian - vxdollface - Thanks! Nic@diningwithastud - Haha I had a lot of trouble limiting myself to a few of them! Gummi Baby - I'm addicted to oreos too! Julia - Hehe we're the same! Thanks! I love your creative brain! You are continually coming up with such incredible creations. These are so sweet! These look fantastic! Definitely wanna dunk that in a cuppa!